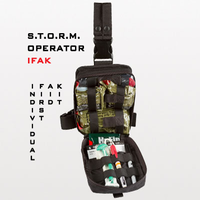 The S.T.O.R.M.® Operator IFAK is one of the smallest Improved First Aid Kits (IFAK) that was specifically designed to mitigate the three leading causes of preventable death in the tactical environment for penetrating trauma (60% extremity bleeding, 33% tension pneumothorax, 6% airway obstruction). This kit provides the necessary equipment for the user/operator to administer immediate self-aid/buddy-aid to injured casualties at the point of wounding. Utilizing Tactical Combat Casualty Care (TCCC) Guidelines and lessons learned from the battlefield, this kit provides law enforcement officers and other public safety personnel with the needed tools to reduce the unnecessary loss of life due to the preventable causes of death encountered in the tactical environment. Made to meet the demands of the austere environment, our modular system can be worn as a drop down leg rig, attached directly to the duty belt or attached to the assault vest or body armor with MOLLE/PALS-style connectors. dimensions: 7.4" x 6.9" x 5"